I was invited as an actor to work with Improbable Theatre on a project called Permission Improbable which explores the lack of women in impro. Impro is a rather blokey territory and I work with two really enlightened guardian reading guys who are feminists but still…this is typical of what happens. We do story improv not sketches – so we improvise whole stories on one night. So I’ll come on in the first scene and I’ll think hello I’m the hero of this story. Tonight it’s all about me. Then we do the second scene and then the Hero arrives and I’m endowed as his girlfriend. This is a Thing. So in Permission Improbable we’re looking at what the girls can do to take that step forward in faith and say – can I have this story? Can this be my turn? And part of that step forward in faith is internal – and there’s nothing much a nice enlightened male improvisor can do to help if your interior monologue is set to ‘I’m not good at this, I shouldn’t be here, I’ll get found out’ – they can’t hear that. We need to make ourselves heard. So far Improbable, led by associate Matilda Leyser have done a week’s work with improvisors Lisa Hammond, Rebecca Harris, Claire Kerrison and myself. 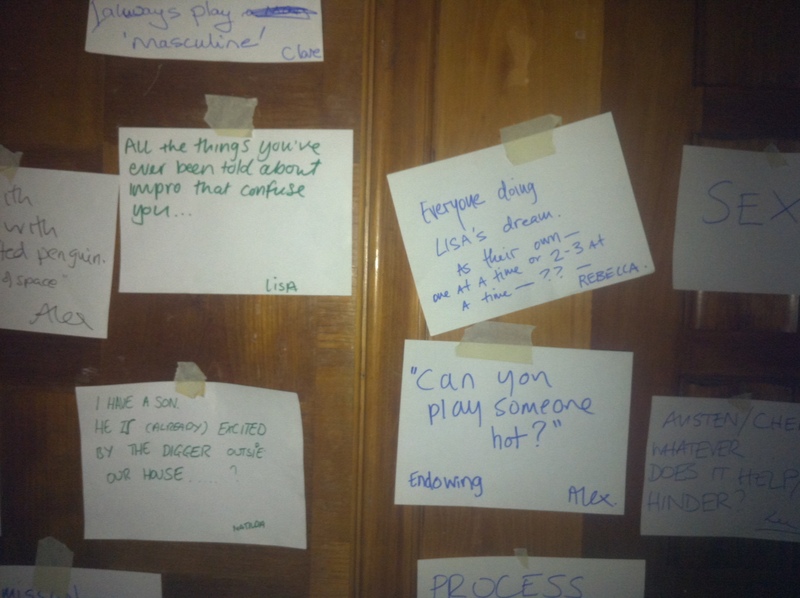 Then Artistic Directors Phelim McDermott and Lee Simpson led a workshop for female improvisors and the plan in the autumn is to make it into a show of some kind – watch this space. Matilda has written a lovely blog on Improbable’s Tumblr about Permission Improbable.